(L-R) Smt Jayashree Balasubramanian, Dr Sreenath Dixit, Dr Kiran K Sharma, Deputy Director General (Acting), ICRISAT, Mr Harish Rao Thanneeru, Minister for Irrigation, Marketing and Legislative Affairs, Government of Telangana, Mr G Malsur, Commissioner Common Area Development Authority, Ministry of Irrigation, Mr Sridhar Rao Deshpande OSD to Ministry. Hyderabad, 03 August 2018| The unique Mission Kakatiya of the Government of Telangana that aims to restore over 46,000 tanks across the state, will be scientifically assessed. 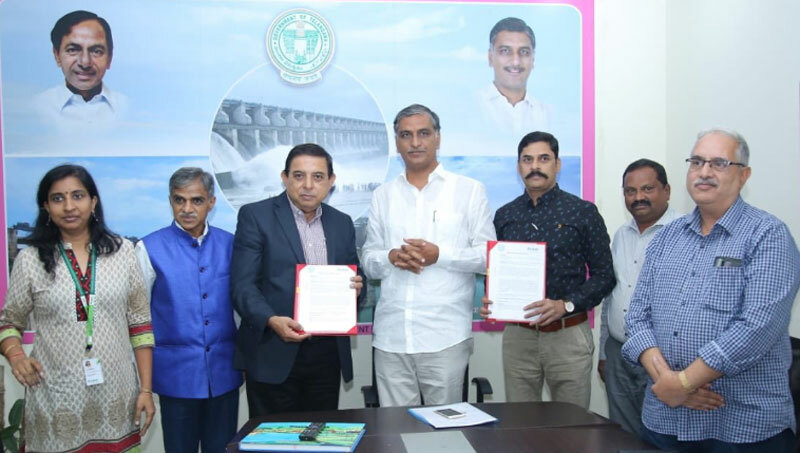 An MoU for this was signed today, between the Ministry of Irrigation, Government of Telangana and the International Crops Research Institute for the Semi-Arid Tropics (ICRISAT), in the presence of the Minister for Irrigation, Mr T Harish Rao. The two-year project will carry out economic assessment of benefits of Mission Kakatiya to smallholder farmers to understand nutrient return to the soil and the productivity and profitability. Through stratified sampling, nutrient content of silt from across 30 districts will be assessed. Demonstration trials will be undertaken with different levels of silt along with balanced nutrient management for major crops. Overall 750 sites will be examined for soil and water health, besides crop diversity and impact on livelihood.